Feature: What next for trade unions? What next for trade unions? As workers we mostly act as if we are nothing to do with trade unions, which as everyone knows are declining in numbers and influence. But they shape what we are – as a class and as a people we rely on large numbers of us being organised. We ignore their decline at our peril. We need to look at how our organisations are distinctive, what's gone wrong with them and what it is about them we cannot afford to be without. The 2005 trade union membership figures published by the Department of Trade and Industry in May indicate that trade union membership in Britain was 6.5 million workers. Four out of five workers in the private sector are non-unionised. Three out of five public sector workers are unionised. One out of five workers is an agency, temporary worker. Decline in union membership has gone from just over 50 per cent in 1979 to 29.3 per cent in 2003, 26 per cent in 2004 and 24 per cent in 2005. Workers need to give serious consideration to the health of the only organisations which represent their interests in the workplace as well as trying to disentangle the myriad contradictory and confusing pressures placed upon us. The why or why not join a union or remain in a unionised workplace has to be answered. Though union membership is slowly declining, statistically the unionised workplace averages hourly wages 17.6 per cent higher than non-unionised workplaces – presumably an attraction but seemingly not one strong enough to turn around decline. Despite nearly 900,000 "new" jobs created in the public sector since 1997, there have not been 900,000 new union recruits. If Britain's organised trade union movement represents 24 per cent of the labour force in government statistics, that ignores a further 6 million-plus workers in non-TUC affiliated trade unions like the Royal College of Nursing, staff associations, employers' company unions, all of which shows that socialised workplace organisation in Britain differs from anywhere else in the world. And it involves nearly double the official numbers. Statistics of trade union density across the world raise many questions. There are 164 million trade unionists world-wide. One in 20 of the 3 billion workers in the world are trade unionists. This reinforces the uniqueness of Britain and the trade union density achieved up to 1980. It is useful to compare it with the situation in the USA and across Europe. In the USA in 2004 trade union density was 12.5 per cent, reaching 36.4 per cent in the public sector. The US trade union equivalent of the TUC – the AFL/CIO – split in July 2005, causing the worst division for nearly 70 years. The Change to Win Coalition led a significant minority out of the AFL-CIO, 5.5 million trade unionists versus 8 million trade unionists into competing camps, which must have Bush and the employers in hysterics. The division, supposedly over whether you organise top down or bottom up, has handed disintegration on a plate to the employers. Trade union density of 12.5 per cent is not going to make the bastions of capitalism shudder. The Service Employees Industrial Union, the prime mover behind the US split, wrapping itself in leftist phraseology, is now funding industrial organisers for the TGWU in Britain as well as parallel organisations such as the "Workers Organisation" part of the London Citizens Organisation, a direct and deliberate attempt to undermine existing British trade unions. FBI, CIA and Mafia infiltration, manipulation and control of the US trade unions has nothing to offer British workers. They have no organic root or purpose. The seemingly bottomless pit of money to fund this imported new organising culture in Britain, where after all trade unionism was invented, must make us smell a rat. The entryism and splinterism within the US trade unions, with all the hallmarks of Trotskyist politics from the 1930s, has ensured that any possible organised labour opposition to Bush's economic policies at home and warmongering abroad is fragmented. In France less than 10 per cent of the workforce are actually union members. However, 90 per cent of French workers are covered by trade union agreements. Trade union density in Poland stood at 80 per cent in 1980, which reflected the historic developments in the socialist countries to tie trade unionism and state power together. But the figure had dropped to less than 14 per cent in 2002 and probably has plummeted further as Poland exports its people as cheap labour to Britain and Western Europe. Trade unionism in Germany post reunification is on a par with British trade union levels. But German trade unions post 1945, though overseen by the British TUC, were embroiled in the state and many British workers would struggle to understand their role and purpose. Though significant set-piece struggles occasionally engulf German industry, for example IG Metall, the manufacturing union, or Ver.di, the public service union, these organisations have very little in common with British trade unions other than numbers and single union organisation across single industries or services. Denmark, Norway and Sweden have trade union density at between 70 and 90 per cent, but this level of density reflects differing social structures not just industrial organisation. 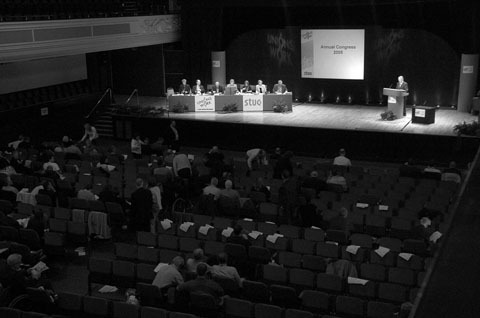 2005 Scottish TUC in session . Britain's organised trade union movement represents just 24 per cent of the labour force in government statistics, though there are a further 6 million-plus workers in non-affiliated trade unions like the Royal College of Nursing. In 1950 the UK boasted 700 trade unions. In 2005 this had dropped to 67 with further mergers being proposed. Is merger a sign of strength? Like company takeovers and mergers or the merging of the failed capitalist economies of Europe into the European Union, the answer is no. No merged trade union to date has grown beyond its starting numbers. Historically ASTMS, MSF, Amicus, the ETU, EETPU, AEEU and all the myriad sectional groupings which have been devoured in the process – the going from 700 to 67 – is about huddling together through weakness. Certain union mergers have had an industrial logic or organic root to them – Unison, Natfhe/AUT, PCS. But ÔUnity 2000' – the proposed merger of school teaching unions – has clearly failed, and we are more than halfway through 2006. None of even the successful mergers has grown beyond the limitations of the organic root and none has cracked the issue of how to recruit. However, both Unison and the University & Colleges Union will see growth in 2006 due to significant industrial disputes; Unison recruited in March 2006 more members in one month than throughout its 12 year history. Something which speaks volumes as to why workers join a union. The proposed merger between Amicus, TGWU and several tiny other unions – Community and Youth Workers Union, National Union of Lock and Metal Workers and so forth – is proffered as the solution to declining trade unionism. The GMB has withdrawn from the merger negotiations. The argument runs on several levels: big is beautiful; capitalism is global therefore you need one global union to counter it; only a large lobbying union can represent the many diverse strands of labour in Britain at the court of the European Union in Brussels. All strands of the argument are deeply flawed. Mergers between unions, like the very founding of trade unions, have always been about the organic defensive needs of workers in particular industries, workplaces, regions and so on at any one time against capital. They have not been about grandiose structures and theories but of the needs of workers as they currently are. Nothing in the proposed "super-union" is organic, very little fits in common across the pitch. Being the biggest trade union in Europe if not the world speaks more of ego and divorce from ordinary workers than reality. We had Robert Owen in 1834 and the Grand National Consolidated Trade Union – it collapsed. Then there was the artificial 'Red' Trade Unionism of the 1920s and 1930s, the Trotskyist answer to global capitalism – which similarly collapsed. The arguments about dealing with capitalism not globalism were clearly outlined in The Communist Manifesto. Ironically, what Marx and Engels described as the worldwide spread of capital, this latter-day globalism, was concurrent with the rise of the industrial working class. The growth of union organisation today in South America, the Far East, India and so on parallels the decline of union organisation in Britain and other European countries. Do we need a super-union to be the super-lobbyist in European Union circles? Doesn't such a proposal equate to the absolute abdication from defending industry and manufacturing in Britain, and its replacement by simple grovelling to the bankers and bureaucrats of the EU? The proposed super-union fits closely with Blair's vision of modern trade unionism as lobbyists, providers of legal advice, self-help societies, community pressure groups, do-gooders, equalities campaigners, charities and so forth. Anything will do but tackling the critical issue of being organised as a workplace, as an industry, as a service, as a working class with its own interests. Such a vision fits neatly with those who have adopted a legalistic resolution to all the ills of society as opposed to a collective class solution. The difficulty with this is that legal challenges to the unions – the GMB have to pay £1 million in compensation to members in Middlesbrough over alleged negligent advice (being appealed against) – will bankrupt the trade unions (see page 13). The GMB and Unison are facing dozens of similar cases pending, which arise from those who have advocated EU equalities legislation. Meanwhile, the TGWU faces compensation claims from British Airways over the Gate Gourmet dispute estimated at £60 to £70 million. The GMB has an estimated £100 million deficit in its pension fund, also subject to litigation. Bankruptcy and the smothering of collective bargaining and collectivity are as dangerous to British trade unionism as death squads in Central America or Iraq are to trade unionists there. The past 25 years in Britain have seen the deliberate destruction of Britain's manufacturing base, the export of industry, the shift of balance from blue collar to white collar working class. Two million manual skilled manufacturing full-time equivalent jobs have been removed from the economy. These have been replaced by casual, part time, unskilled jobs. From 1979 to 1997 Britain stood still on the job creation front. Jobs that were created never surpassed the numbers destroyed. So the difficulty of a working class that isn't working or is disorganised, demoralised and losing the commonality of industry has posed the greatest challenge to passing the baton of struggle from one generation to another. The anti-union legislation, continually reinterpreted in legal advice to the unions, has made it virtually impossible to have a legal strike. Though the strike figures for 2006 will have a huge blip due to the numerous pensions disputes, overall the number of disputes and days lost through industrial action has been declining. The figures are now on a par with the first statistics kept in the 1890s. From this comes the perceived inability to successfully resist offensives from capital that has further undermined confidence and sense of purpose. To reverse this situation we have to get organised. Getting organised means doing it for ourselves: every worker in work, every worker in their trade union, every workplace unionised. The trade unionism of waiting for knights on white chargers to do it for us, leaving issues to the do-gooder, the individual human rights expert, the equalities missionary and the charitable would-be saints leading the largest union in the world are over. In fact it never started or ever had any basis in the British labour movement. We do not divide on gender, race, colour, age, religion or community, immigrant or indigenous. We have to bridge the generational divide which has occurred in workers' consciousness – the real though temporary victory of Thatcher and her grandchild Blair – and reassert unity, class and being an organised worker. The Communist Manifesto, Marx & Engels "The Special Nature of British Trade Unions"
Reg Birch, appendix to Reg Birch: Engineer, trade unionist, communist, £10 p&p from Workers.